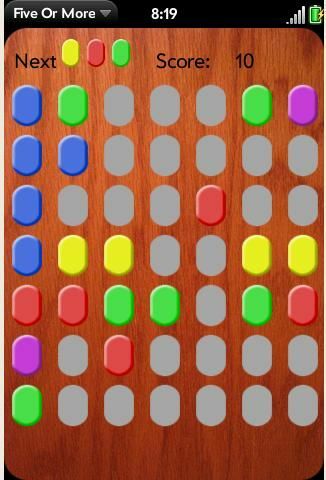 5 or more is a game where you have a 7 x 7 board and you move the colored pieces(red, green, blue, yellow and purple) around in order to line them up in a row of 5 or more. When you do, they disappear and your score goes up. However, each time you move a piece, 3 random pieces will appear in random spots. You play until the board is filled . If you have not played this game the past, Please read the help menu though. I have tried my best to make it as detailed as possible. I have also included an email address for you to contact me if needed on there.